Evaluation of the performance of soil tillage machines is carried out in one or more indicators making a quantitative comparison between them or their criteria or generalized ones. These methods can provide an independent evaluation of one or another machine. They can not determine the degree of perfection of the machine. Proposed a comprehensive evaluation criterion the degree of perfection of the machines. It is used to estimate the plow, created by us and a standard one. It is proved that the new plow has a degree of perfection – a complex criterion D = 0,727. In this case D – criteria is 1.35 times higher than the standard plow, i.e. the new plow is more sophisticated than the standard, but not ideal. At the present stage soil tillage is done mainly by applying the principles of mechanics. Its development is in three directions: improvement of the working bodies, increasing the productivity of agricultural machinery and power of tractors. All these directions lead to the accumulation of a wide variety of attachments, very large in size and mass of agricultural machines and tractors, which ultimately go to its limits. These features of the present-day stage are exhausted. It is necessary to look for other methods for tillage of the soil, using other principles of the physics or other areas of science. The traditional approach in many agricultural facilities has been to keep machines running to increase production revenues, often with consequences to assets – consequences that result in higher maintenance costs. Autonomous maintenance is a reliability initiative that provides alternative to this dilemma. Разгледани са предвидените в законовата уредба критерии за оценка на оферти по Закона за обществените поръчки и са анализирани предимствата и нодостатъците им при провеждане на процедури за закупуване на трактори и самоходна земеделска техника. Разработена е методика за комплексна оценка на офертите по критерия – икономически най-изгодна оферта, базирана на обективни технически и икономически критерии. Така определената комплексна оценка позволява в максимална степен да се отчете влиянието на всеки компонент в нея при запазване на предварително определената му тежест. В статье приведены результаты исследования гидроэлеваторов и сравнения конструкции с прямоточным подводом пассивной всасываемой среды в приемную камеру и конструкции гидроэлеватора с подводом пассивной среды с закруткой. Экспериментальные исследования показали, что закрутка оказывает крупномасштабное влияние на поле течения; на расширение струи, процессы подмешивания и затухания скорости в струе. На все эти характеристики влияет интенсивность закрутки потока. Исследования позволили выявить, что достигаемый положительный эффект в конструкции с вихревым подводом всасываемой среды значительно больше, чем для конструкции с обычным прямоточным подводом, на основании чего можно полагать о предпочтительности применения данной конструкции в случаях, когда требуется увеличить подачу струйного насоса. 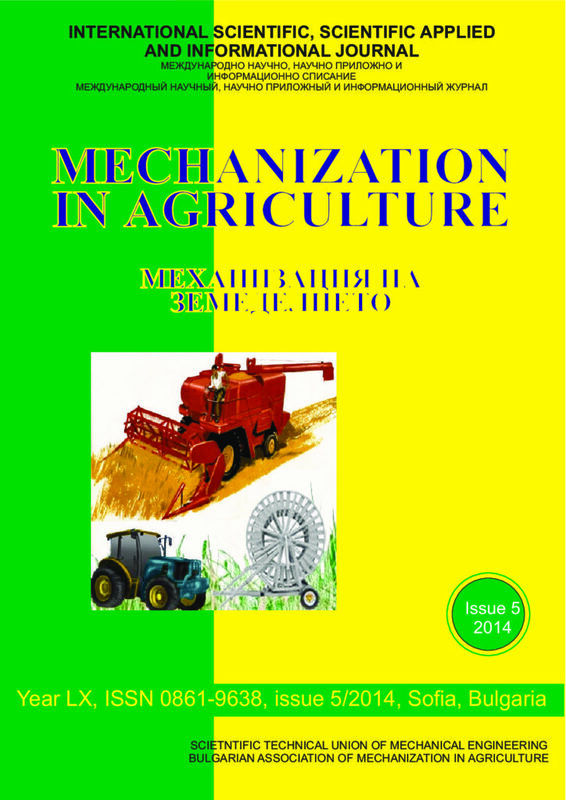 The article concern to the scientific and research works related to the development of mechatronic control system of sowing unit in the tilling-and-sowing combined machine. The essence of the project is the use in the combined machine of innovative control system responsible for the seeding process. The system will control the work of seeding unit (drive) and will maintain a predetermined depth of seeds sowing. Grooved or pinned units used in seeding are characterized by variability in application rate as a function of the changing conditions of work (e.g. on the slopes). In the proposed solution, on the basis of the identification of the sensitivity of the sowing machine on the changing conditions of work, the control algorithm will be developed, which after application to a controllable propulsion system equipped with the necessary sensors will eliminate inaccurate dosing. Project/Grant No K2/IN2/64/182979 is co-financed from the budget allocated for science.